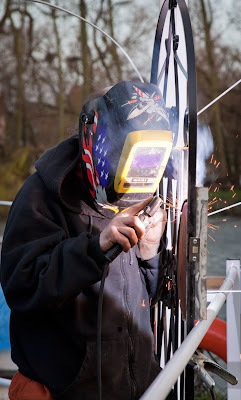 Fixing the gate on a house boat. What a super helmet. It looks a tad American. Take care of your eyes, look in another direction. Super helmet is right. That is quite colorful. Great job on this photo. I can see the sparks flying. Your men at work series is a great idea! I just had a look at the other 31 and really like them. The glimpse of bald crown with longish hair behind, makes me wonder what this workman looks like under the customised helmet; certainly not the youngster I at first imagined. Thanks Anka. It is not so easy to get close to men at work. Security guards, protective fencing, fluro clothing, all make it quite a challenge.